Surviving an assassination attempt, Ella is whisked to safety by an unlikely saviour, only to learn that her parents and little brother have been gunned down back home in London. Who could possibly hate Ella and her family so much they'd try to wipe all of them out? And now she's survived, will they come for her again? Kevin Wignall skilfully draws us into Ella's plight, creating a superb thriller that is fast-paced but never seems rushed or underdone. It's a slimline story, at 210 pages, but in no way 'thin'. There's a smoothness to Wignall's writing, a dose of that intangible magic potion the very best crime writers have that bubbles away beneath plot, character, and setting, bringing everything together seamlessly. You know it when you read it, and you can tell in the first few pages of THE HUNTER'S PRAYER that you're in very good storytelling hands. Boxes for action, mystery, and intrigue are well ticked, but there is plenty of depth and complexity to the eclectic role-call of characters too, from Ella and hitman-turned-bodyguard Lucas to a supporting cast including Chris, Ella's uncle Simon and his family, and underworld figures. For unbeknownst to Ella, her father's former and perhaps recent life was tied to the underworld, and as she struggles with the deaths of those she loved, the attempt on her life, and the uncertainty of who was responsible, why, and whether they'll ever be brought to justice, she gets drawn into that world for answers. Wignall does a terrific job not only with action and violence, but showing the impact of the violence on the people involved, whether they are professionals, amateurs, or innocent bystanders. Crime isn't just about whodunnit or whydunnit, but also the reverberations for victims, families, criminals, and cops. 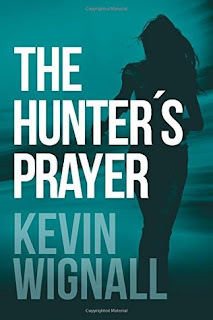 A delightful aspect of THE HUNTER'S PRAYER is the narrative voice, threaded with viewpoints, prose, and turns of phrase that are refreshing in a well-read genre that can at times 'sound' a little the same. Somehow Kevin Wignall has managed to pen an absorbing, action-packed 210-page thriller about a hit man who might not want to be a hit man anymore and an innocent girl falling into darkness after coming face-to-face with his world, and have it shot through with intriguing philosophical themes, without ever losing steam, dragging things out, or seeming soap-boxy. A master class in style and substance, laced with subtext. Refreshing and original, one of my favourite reads of the year. THE HUNTER'S PRAYER was originally published as FOR THE DOGS, and has recently been republished after falling out of print. It is available here. A feature film based on this book, starring Sam Worthington, will soon be released.